Zenith desk is designed to excel where other desks fail. Its ultimate simplicity and durability makes it a winner in every situation. 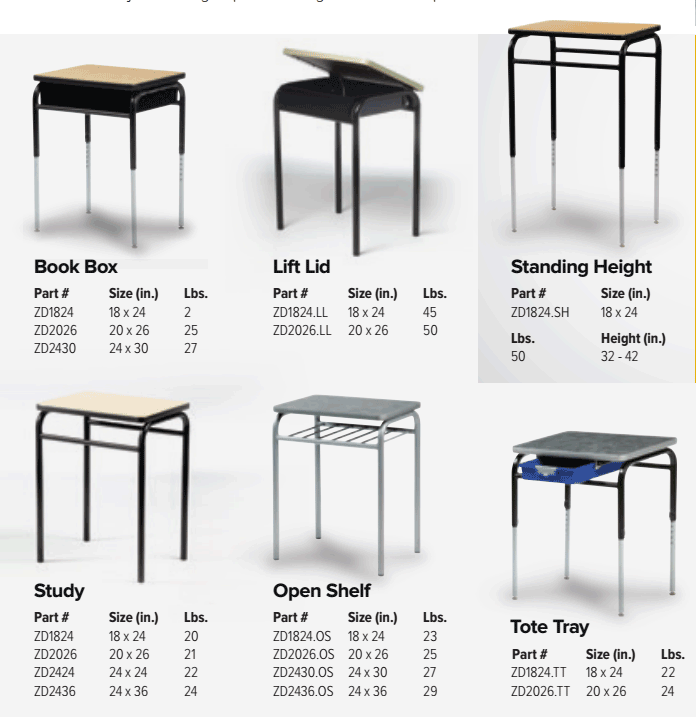 The Zenith desk is suitable for every student’s need, with storage, work surface and adjustable height options all integrated around the proven frame of Zenith. 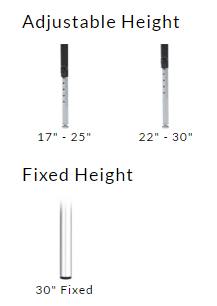 "The ZENITH Standing Height Desk is incomparable. 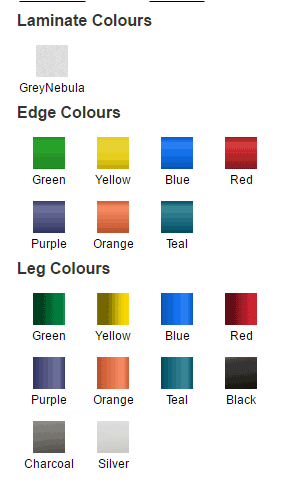 Standing is a great way to eliminate fidgeting, which thereby improves the learning experience. Standing up not only improves focus and learning, it can help decrease obesity." 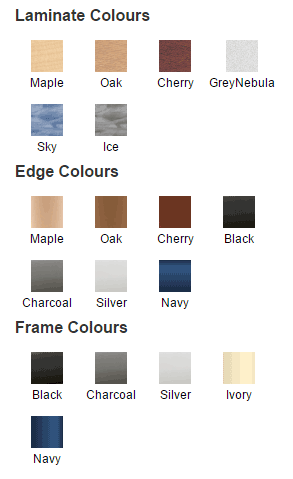 Note: Laminate and Edge Colours must be in the same Colour Series. i.e. 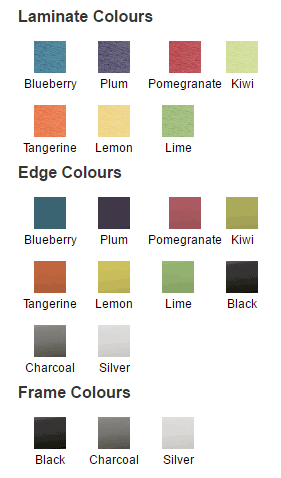 : you cannot select a Maple Top (Standard Colour Series) with a Red Edge (Fresh Colour Series). 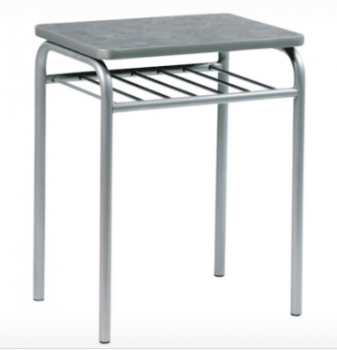 SKU: ZD1824 - 18" X 24"
SKU: ZD2026 - 20" X 26"
SKU: ZD2430 - 24" X 24"
SKU: ZD2430 - 24" X 30"
SKU: ZDBB1824 - 18" X 24"
SKU: ZDBB2026 - 20" X 26"
SKU: ZDBB2430 - 24" X 30"
SKU: ZDLL1824 - 18" X 24"
SKU: ZDLL2026 - 20" X 26"
SKU: ZDOS1824 - 18"X 24"
SKU: ZDOS2026 - 20"X 26"
SKU: ZDOS2430 - 24"X 30"
SKU: ZDOS2436 - 24"X 36"
SKU: ZDTT1824 - 18"X 24"
SKU: ZDTT2026 - 20"X 26"
SKU: ZDTT2430 - 24"X 30"
SKU: ZDTT2436 - 24"X 36"
SKU: ZDSH1824 = 18" X 24"